This week we have been busy continuing to create our Frankenstein Monsters. We began to paint them today and we will complete them when we return after Half-Term. As we have learnt the story of Mary Shelley’s Frankenstein, this week we decided to write a biography of Victor Frankenstein’s life using writing techniques we have been learning in English recently. In Welsh we have been writing postcards to loved ones using sentence patterns that we have learned so far. We have been writing about where we went; how the weather was; what we enjoyed doing and where we will go next. In Music with Mrs Thomas this week the children have been writing their own raps about how to make the school a better place. The children recorded themselves and enjoyed watching themselves back on video. We hope you have a relaxing Half-Term and we look forward to seeing you all return safe and refreshed for a Christmas term which promises to be very busy. This fortnight we have been looking into the human skeleton. We have been busy measuring our own and class-mates bones using measuring tapes. We have been learning facts about the human skeleton and the purpose of having one. We have compared our skeleton to animal skeletons and seen many similarities and differences. This term our class story has been ‘Frankenstein’. So we decided after finishing it that we would create our own monsters which will have the features of a Frankenstein monster. Some of us have decided to put in some working organs such as a heart and lungs. We have all designed one and this week we began to make it which got a little messy! We will hope to finish them next week. In maths we have been working with fractions and splitting items into groups. Some of us have been finding fractions of a given number and some of us have been finding equivalent fractions. Our Welsh this term is coming on nicely and lots of us are speaking it more and more freely around the class. We have been learning about going camping in Welsh and we have learnt lots of new vocabulary and sentence patterns. Ask your child if they can remember some of our camping vocabulary. Over the last two weeks we have been swimming in the Western Leisure Centre which all the children thoroughly enjoyed. All the children will be receiving their well deserved certificates shortly. In school we have been learning even more about the human body and how some of the major organs work specifically the Heart and Lungs. We began by looking at what actual organs look like in the flesh (Excuse the pun). Some children were a little apprehensive at first but they all managed to get their hands dirty and feel the organs. Please see the folder below (Organs in the flesh) for a gallery of our pictures. In Maths we have been practicing our Place Value (Hundreds, Tens & Units) by adding and subtracting vertically. We have also been practicing our dividing skills by using the multiplication tables. In language we have been distinguishing between verbs and nouns. We have been writing in the first and third person and we have been writing explanations about how our heart and lungs work. We have also been having regular spelling tests, handwriting exercises, phonics sessions and Maths tests. Welcome to a new and exciting year in Pencaerau. This term Year 4 will be learning all about the Human body. This last week we have been mainly looking into the heart. We have been measuring our Heart Rate by counting the beats we hear. We can find our pulse on our neck and our wrists. We can also feel it on our chests. We found out that at rest our heart beats at quite a slow pace and if we do exercise our Heart Rate increases. Most of us found that skipping makes our Heart beat faster than doing press-ups. In our I.T. 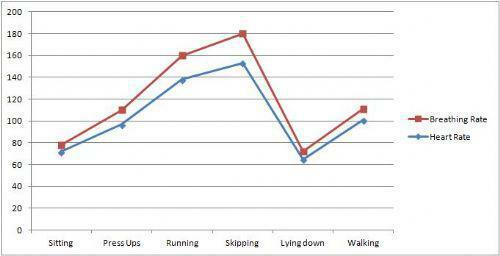 sessions we inputted our data into graphs and this is an example of what we found. Also in I.C.T. we were each assigned a part of the body to research. The children then reported back to the class and we found out some very interesting things. Ask your child if they can remember any interesting facts about the lungs, mouth or blood vessels. We have also been doing some spelling tests and handwriting practice. The children will be given weekly spellings to take home based on their individual needs. They will also be given other homework to help support their learning. Please make sure homework is returned each week by Wednesday at the latest so appropriate homework can be set the following week.